Pairs Trade - What Does It Mean? What is a "pairs trade"? 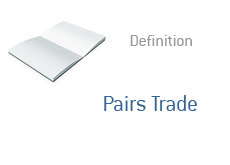 What is the definition of a "pairs trade"? Certain securities largely move in lockstep with each other. For instance - Coca-Cola and Pepsi, or Ford and General Motors. These stocks will generally move in the same direction, day after day. A "pairs trade" is when the two stocks start to move apart from each other, and you are betting that they will converge once again. In order to implement this strategy, you would need to go long one of the stocks and short the other. So, let's take a KO/PEP pair as an example. You have come to the conclusion that the movement of the two stocks is highly correlated. KO suddenly breaks out and trades up over 15% over a one-week period, while PEP remains flat. You bet that the price of the two stocks will converge over the short-term, so you decide to implement a pairs trade by shorting KO and buying PEP. If the two stocks do start to converge, then you will make money. However, if KO continues to break out and PEP remains stagnant, then your pairs trade will lose money. Pairs trades can be applied to pretty much anything - indexes, options, etc.